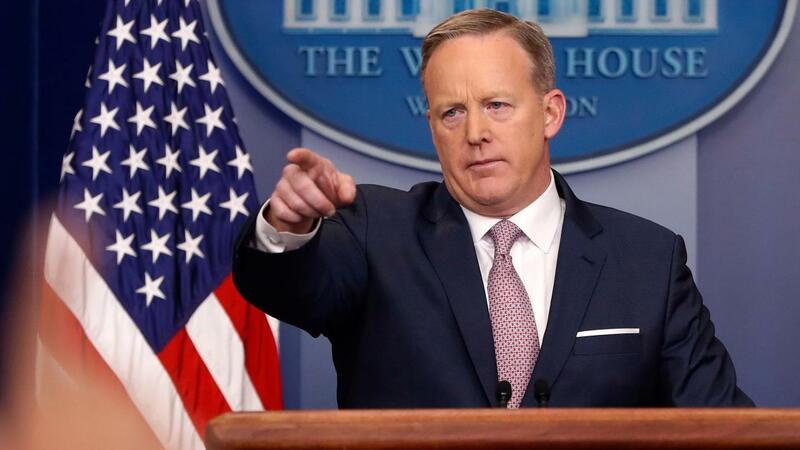 Sean Spicer, White House Press Secretary, denied he's leaving the podium | Circa News - Learn. Think. Do. White House Press Secretary Sean Spicer on Tuesday waved off reports that he may be searching for his own replacement. "I'm right here, so you can keep taking your selfies and stuff," he said at the daily White House press briefing. "But look, it's no secret we've had a couple vacancies, including our communications director, that's gone for awhile." Spicer added that "we have been meeting people that may be of service to this administration." "But we're always looking for better ways to articulate the president's message and his agenda," he said. "And we'll continue to have those discussions internally and when we have an announcement of a personnel nature, we'll let you know, if that's a good deal." ORIGINAL STORY: The White House communications operations could be changing, with Press Secretary Sean Spicer searching for his own replacement at the briefing room podium, Politico reported Monday, citing "two people with knowledge of the effort." Fox News personality Laura Ingraham and Daily Mail editor David Martosko have been contacted by Spicer and White House Chief of Staff Reince Priebus regarding the press secretary role, a White House official told Politico. After communications director Michael Dubke resigned last month, the White House has been looking to shake up the press shop. “We have sought input from many people as we look to expand our communications operation. As he did in the beginning, Sean Spicer is managing both the communications and press office," White House deputy press secretary Sarah Huckabee Sanders said. Spicer apparently wants to move into a role senior to the communications director and press secretary. Dubke and Spicer have been criticized by President Trump and senior staff for how they handled the response to the president's firing of ex-FBI director James Comey. But despite what Spicer might want, a Trump adviser told Politico that Trump has not approved any changes, and until he does it is all just talk. "Until you have the president buying in, any outreach or talk, is just that," the source said.